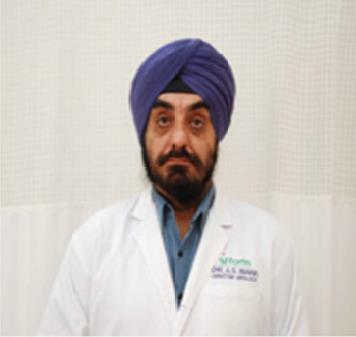 Dr. A. S. Bawa, MBBS, MS (General Surgery), MCh (Urology) is the Director of Urology department at Fortis Hospital, Mohali. Prior to that, he had career stints as a Head of Department of Surgery at Government Medical College & Hospital, Chandigarh. Also he has been on the advisory board of various health departments like Punjab Health System Corporation, Director Health Services, Punjab. In addition to his commendable professional record, Dr. Bawa has held important posts in the field of academics as well, and has trained about 80 doctors in surgery & urology as senior residents. Apart from this, he has also been an examiner in various Universities of Northern India, such as Guru Nanak Dev University, Amritsar; Baba Farid University, Faridkot; Delhi University; Himachal Pradesh University, Shimla. Dr. Bawa after completing his MBBS went on to accomplish post graduation in General Surgery from the renowned institute, Post Graduate Institute of Medical Education & Research, Chandigarh, succeeded by the super specialization in Urology. Dr. Bawa has been credited with over 15,000 surgeries which include procedures pertaining to urinary stones, prostate and kidney diseases etc. Dr. A.S.Bawa has been honoured with numerous awards and commendations at various forums in the field of medicine. He has contributed about 40 National & International publications to peer reviewed journals. Moreover, he is an active member of various academic associations and frequently participate in orations.